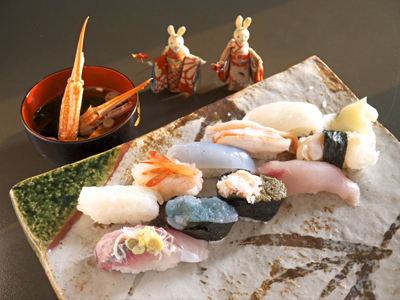 The color, luster, and appearance of the fresh toppings used in this sushi shop show its commitment to high standards. The black seats inside the restaurant give it a modern atmosphere. The shop owner's wife also curates a small exhibition of old fabrics, so why not take a look when you go visit!